Posted on April 20, 2015 by jenlocke1 CommentsNo Comments on New book by ICCHS staff- now available! New book by ICCHS staff- now available! As part of the EC-funded MeLa project on European Museums in an Age of Migrations, ICCHS researchers have published a number of books. The most recent of these is just out. It is entitled Museums, Migration and Identity in Europe and it is at the intersection between museum studies and migration studies. With ever increasing attention to migration both in political and cultural spheres, the book is a landmark contribution to a critical field of study and practice. The imperatives surrounding museum representations of place have shifted from the late eighteenth century to today. The political significance of place itself has changed and continues to change at all scales, from local, civic, regional to national and supranational. At the same time, changes in population flows, migration patterns and demographic movement now underscore both cultural and political practice, be it in the accommodation of ‘diversity’ in cultural and social policy, scholarly explorations of hybridity or in state immigration controls. The book investigates the historical and contemporary relationships between museums, places and identities. It brings together contributions from international scholars, academics, practitioners from museums and public institutions, policymakers, and representatives of associations and migrant communities to explore all these issues. Sharon Macdonald, University of York, UK. ICCHS students and associates interested in buying the book with a 50% discount should contact Chris Whitehead for a discount code. Join us this Saturday, 18 April, for a day of special events at Housesteads Roman Fort. There will be special talks, tours and activities, including a talk by Peter Stone. Peter worked for UNESCO as part of the team that produce the World Heritage Education Project and kit, ‘World Heritage in Young Hands’, in the 1990s. He was also the Chair of the Hadrian’s Wall management plan committee. Peter’s talk will focus on the meaning of a World Heritage Site in the wider sense. Why are they classed with such importance and what is their importance in the wider world and in relation to the United Nations. 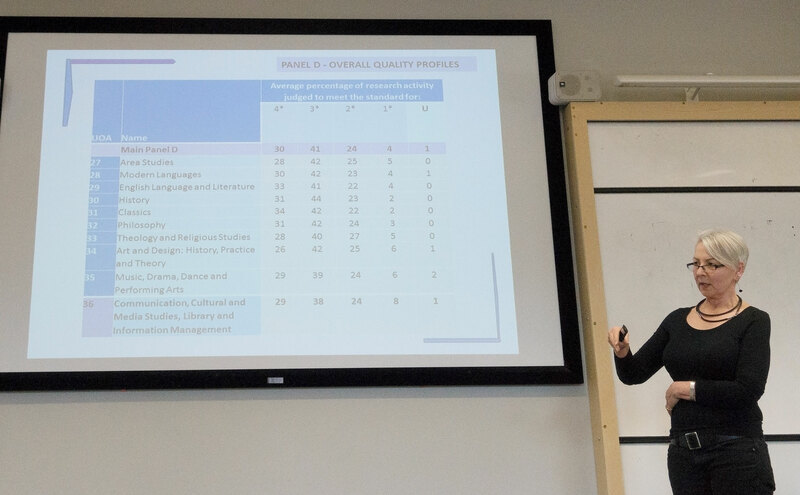 ICCHS and Media and Cultural Studies (MACS) were delighted to receive feedback from Professor Karen Ross (Northumbria University) on the REF2014 sub-panel 36: Communication, Cultural and Media Studies, Library and Information Management. ICCHS and MACS made a joint submission to this panel. Karen was member of the sub-panel. Karen did some ‘crystal ball gazing’ and provided us with some of her thoughts about how REF2020 might shape up. For example, she suggested that the proportion of profile dedicated to impact might increase but that outputs will remain as the primary indicator. Karen also emphasised the importance of strategising now on potential impact case studies, so that we can generate the necessary supporting data in order to tell ‘good stories’ about our studies. An important part of the ‘good story’ is to create strong linkages between the underlying research and impact! Ultimately, however, it is imperative that we pay close attention to the criteria and guidance provided by HEFCE. Thanks for this Karen – it was extremely useful! Professor Peter Stone OBE, Head of Newcastle University’s School of Arts and Cultures, has been exploring what we tolerate as acceptable and, crucially, unacceptable practice towards protecting cultural property during war.